Lund SX106T - Lund Elite Series SX-Sport Style Fender Flares - FREE SHIPPING! I was a little disappointed with the installation method and the rubber gasket around the outside. But so far the installation has held with no problems and the gasket really gives it a finished look. Very surprised and happy with them so far. These were easy to install, but then I am mechanically inclined, took my time, removed one wheel at a time and took about an hour and a half, no problem. Very satisfied with this product. Easy to install, look great on my truck. 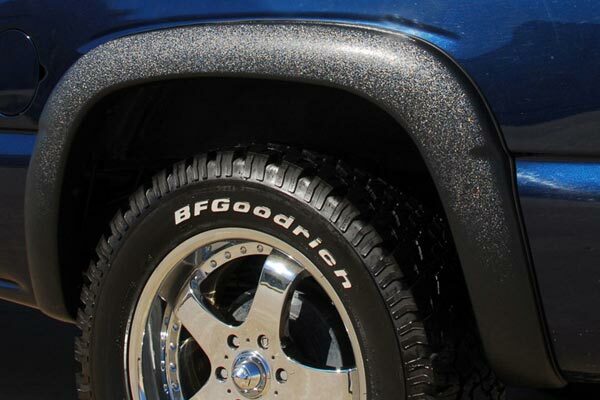 I had the SX textured model fender flares put on my 2011 Z71 4door with the 5'8" bed. They fit nicely, protect a large area of the fender and look great. The only problem I had was the factory mud flaps would not fit over the fender flares. That problem was solved with another brand mud flap. Overall I am very pleased with the fender flares and the way they look on the vehicle. PRESTIGE COMPANY WARRANTY IS NO GOOD. I've have read reviews before buying just like you do,I hope. I order a set of fender flaires in April 2012 and rec. them in 3 to 4 wks. They send the wrong ones .Returned,and had to order the ones I ordered the first time over again. Rush order,will rec.in 3 to 5 working days.Rec. a e-mail saying out of stock.Will ship in 3 to 4 wks.Well I was wondering if I really wanted them or not.REC. the last of June.I installed them, " 3 " out of 4 fit good.I call prestige and got the run aroud. After 4or5 calls to prestige, I was told to call this number and Robert would be able to do more for me.Well let me tell you what they can do for there defects.I was told the faires cost about 85.00-90.00 seperate,and about 40.00 to ship.By the way, in the instructions it tells you not to drill any holes in rear flaires.So to save the com. a 130.00 the ---- with the custmer,I was told he could change the wannanty,and I could dill holes to make it work,and he would send me a e-mail to back it up.I never rec.any e-mail,so I call AUTO-ANYTHING the place I order them from, and they would talk to prestige.I rec. a e-mail from AUTO ANTHING saying I would rec.a replacement,THANK YOU PEOPLE AT "AUTO ANTHING' and the ---- with PRESTIGE. MY HAT IS OFF TO AUTO ANYTHING AND THANKS AGAIN. AL. 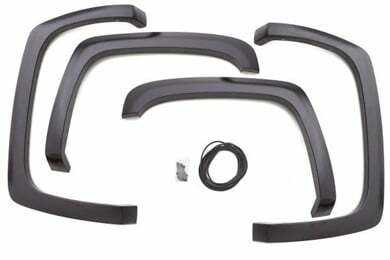 2008 Chevy 3500HD Duramax LB SRW The fenders install easily with the provided supplies (rubber seal and metalic clips). They look and fit very well and add some style to the body. 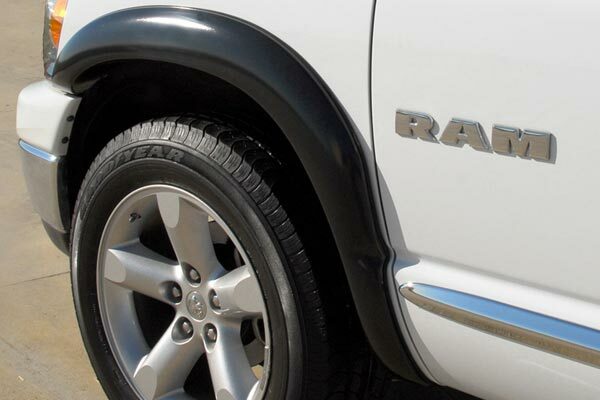 note: The factory mud guards will not reinstall over the fender flares w/o modification. I would suggest you fabricate a simple mud guard and use the lower 2 original mounting holes for your new mud guards. The order went through without a problem and the product was shipped rather quickly the process was very smooth. 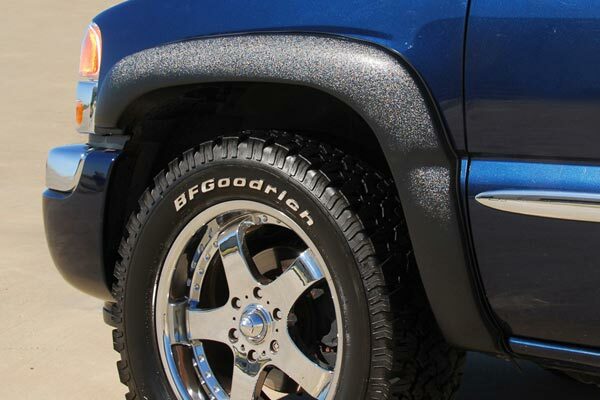 I was very happy when I seen the textured fender flares. The cost for the flares was a great deal! When I recieved them, it was even better. When I installed them they looked great! Very easy to install. Less than 30 min. Other online sites had advertised them, but for whatever reason could not deliver. AutoAnything no problem. Less than a week had them on my door step! This is where I will do my online shopping for my truck from here on, no doubt!!!!! Easy to install, good quality, and look nice. The fit was perfect for the front, but a bit off in the rear. I was surprised the rears were 2 different sizes, and no indication which was for which side. After trial, I went with the "best fit",but both sides have 1/2" - 1" gaps in coverage at the bottom. Too bad, or I'd rate them excellent. I bought a set of the textured Prestige Sx fender flares for my 11 Silverado. They were very easy to install, took about 30 minutes. The flares are made of oem quality plastic and fit great. They really give the truck a unique look and have an oem factory feel. I only have two complaints;1)the rear flares cover up sections of the "z-71" decal & 2)the flares didn't cut down the slash/spray from the wheels as much as I was hoped they would. I'm very happy with them. 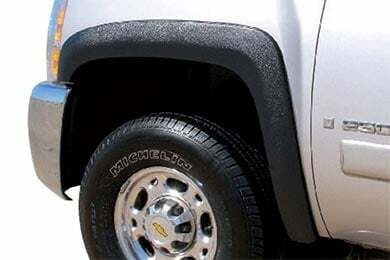 I just put on my Prestige Fender Flares on my 2011 Chevrolet Silverado 2500HD, and they look great and only took about 30 minutes from start to finish and the fit is perfect!! Easy install and really enhanced the look of my truck. Only disadvantage is they cover half of the Z71 sticker on my 2010 ext. cab. I was totally impressed how perfectly the flares fit my truck, how great they look and the ease of installation. Also, totally impressed with Auto Anything and the people I dealt with. I put my order in Wednesday afternoon and it was at my door the following Monday. Will not hesitate to do business with your company in the future. Reference # 765-587-870 © 2000-2019 AutoAnything, Inc.